Phosphorous and nitrogen used in Midwestern agriculture runs off into rivers and streams and eventually into the Gulf of Mexico where it displaces oxygen, suffocating marine life and creating what scientists call the Dead Zone. A University of Missouri team is among a national effort to measure the problem and test solutions. Over the next nine years Ranjith Udawatta, research associate professor of Agroforestry and Watershed Management Research at the College of Agriculture, Food and Natural Resources, and Shibu Jose, the Director of The Center for Agroforestry at the School of Natural Resources, will be analyzing runoff water from a dozen farms in Missouri. Their research goal is to determine what kinds of materials are going into the state’s streams and into the Mississippi River and Gulf of Mexico. With those results, they will work with farmers participating in the research to create improved ways to mitigate runoff, sediment and nutrient losses. 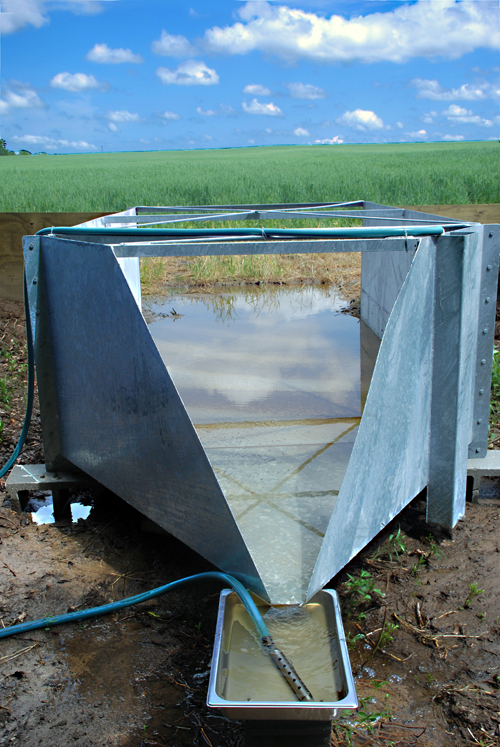 One of the collection devices installed on a Missouri farm. 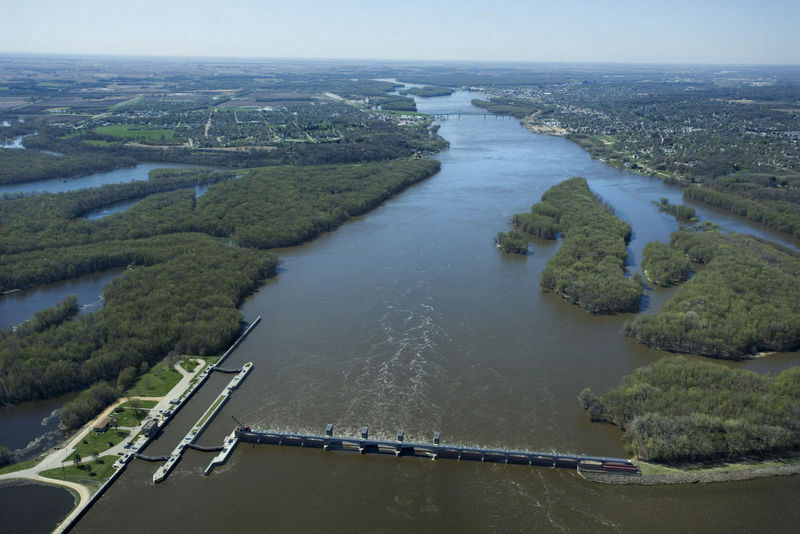 The project is part of the national Mississippi River Basin Healthy Watershed Initiative funded by the USDA’s Natural Resources Conversation Service. Collection devices are being installed on watersheds along the Missouri and Mississippi River basins for water quality monitoring. Farm nutrients that flow downstream create what’s called a hypoxic zone, or Dead Zone, in the Gulf of Mexico waters from Houston to Biloxi. The nutrients feed huge algae blooms that later die and sink to the seabed, consuming oxygen as they decompose. The resulting low oxygen levels choke out aquatic life. Warm surface-water temperatures make hypoxia worse in the summer. The Mississippi River, which stretches from Minnesota to the Gulf, carries an average of 436,000 tons of sediment each day, Udawatta said. About 40 percent of the world’s corn and soybeans are produced in the Mississippi River Basin. Two of the Missouri collection devices are located in Audrain County, two in Knox, three in Linn, one in Randolph, two in Chariton and two in Livingston. These north-central Missouri areas were chosen because they are agriculturally-intensive areas with a largely clay-based soil prone to runoff. Udawatta is looking to add a collection point in the Bootheel of Missouri, one of the most agriculturally productive areas of the country. The devices consist of 15- to 40-ft. wooden berms that channel runoff into metal collection tunnels. In the well of this tapered flume, a meter measures the flow rate and volume of runoff water. After each rain, water samples are taken to Mizzou and analyzed for sediment, nitrogen and phosphorus concentration to determine the level of nutrients running off each test field. 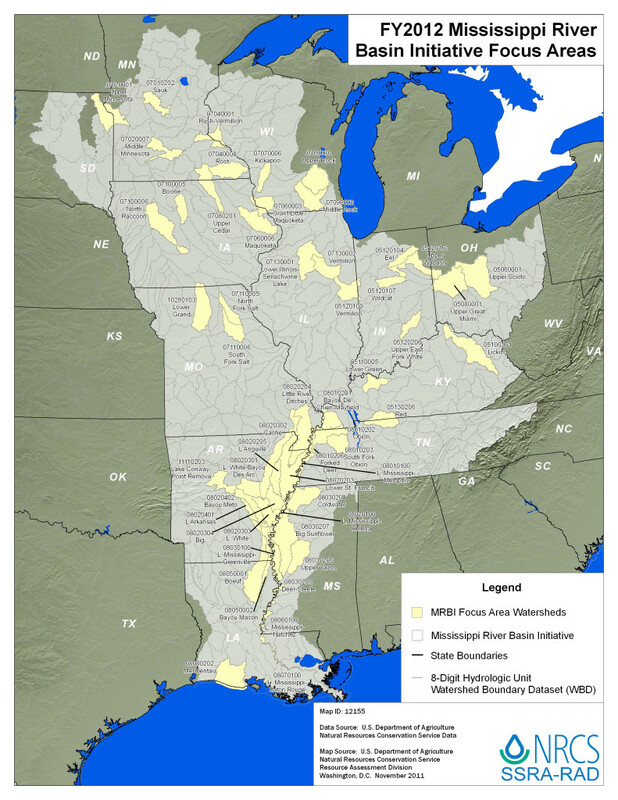 Map showing testing locations that are part of the national Mississippi River Basin Initiative project. That data is correlated with the duration and severity of the rainfall event. This shows the scientists if the materials are running off early or late. So far in 2013, Udawatta and Jose have measured more than 80 runoff events. Udawatta and Jose will collect baseline data for three years to determine the type and volume of runoff pollutants. Then, they will work with farmers participating in the research to try different mitigation strategies. This could include planting grasses and trees, terracing the land, nutrient management approaches, crop rotation or cover crops. The MU team’s data will be compared to others in the national program. Udawatta said identifying the best mitigation strategies will benefit farmers who want to keep valuable topsoil in place and nutrients on the farm. “By slowing or reducing runoff, they will be able to more efficiently employ nutrients and fertilizers with less waste and greater yields and with more savings,” he added. Udawatta said it is critical that several sites in different geographic areas be tested because no one mitigation solution will work everywhere. Depending on geographic, terrain and soil considerations the best solution could be cover crops, a different type of crop rotation or nutrient management system or the creation of grassy waterways along runoff paths that absorb nutrients before they reach the watershed. Udawatta points out that his research will also help reduce unwanted runoff into Missouri’s lakes.